The Canadian Space Agency, established in 1989, is responsible for coordinating all government-funded space activities in Canada. Some of the CSA's more high-profile projects include its robotics, most famously the Canadarm and Canadarm2. Additionally, several Canadian astronauts have flown in space. The most recent was Chris Hadfield, who commanded the International Space Station in 2013. David Saint-Jacques is the next astronaut slated to fly; his launch is scheduled for November 2018. A few years ago, the agency received a boost of stimulus funding to fund rovers and robotics projects. A 2012 report, however, said the agency lacked long-term funding stability and urged the government to provide more money for the CSA's activities. Since then, Canada has committed to funding its share of the ISS through 2024, matching the aims of NASA and several other space agencies. Government-funded civilian space activities long predate the formation of the CSA. For example, the first Canadian satellite, Alouette, went into space in 1962. Sounding rockets were also used regularly to do upper atmosphere research. Five years after the first satellite launch, a government-sponsored report led by John Chapman outlined the space activities of the country in universities, private companies and government departments, of which there were many. NASA invited Canada's government to join the shuttle program in 1969, which eventually resulted in the development of the Canadarm — a robotic arm capable of manipulating satellites in space. The project was led by SPAR Aerospace and initially funded by Canada's National Research Council (NRC). The Canadarm made it into space for the first time in 1981, for the second shuttle mission (STS-2). It so impressed NASA that the agency invited Canada to send astronaut applications. Canada's first astronaut, Marc Garneau, flew aboard the space shuttle Challenger on STS-41G in 1984. 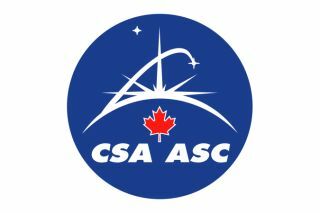 As Canadian space activity increased, the government passed an act of Parliament in 1989 establishing the CSA, whose mandate was to "promote the peaceful use and development of space for the social and economic benefit of Canadians," according to the Canadian Encyclopedia. With its payload bay open, Canadarm robotic arm deployed and window covers removed, space shuttle Atlantis is ready for its public debut on June 29, 2013 at NASA's Kennedy Space Center Visitor Complex in Florida. The first Canadian astronauts were payload specialists, meaning that they were responsible for certain experiments on the shuttle and did not perform duties such as spacewalks. As the program matured, however, NASA invited the Canadians to train as mission specialists. Garneau and Hadfield, who was a part of the second Canadian astronaut selection in 1992, were the first to receive this training. In the 1990s, Canada racked up a series of astronaut milestones: first woman (Roberta Bondar, 1992), first Canadian on space station Mir (Hadfield, 1995), first Canadian to operate the Canadarm (Hadfield, 1995) and first Canadian to visit the International Space Station (Julie Payette, 1999). Since then, Canadian astronauts have gone on to do spacewalks (Hadfield was the first, in 2001) and more complex duties on the space station. This culminated in 2013 when Hadfield became the first Canadian commander of the station. Canada currently has four astronauts: Jeremy Hansen and David Saint-Jacques (selected in 2008), and Joshua Kutryk and Jennifer Sidey (selected in 2017). Saint-Jacques is assigned to Expedition 58/59, which is scheduled to begin in November 2018. Hansen has not flown yet, but media reports have said it may be around 2021 or 2022. Kutryk and Sidey are both in basic astronaut training and will not be eligible for flights until at least 2019, although they likely will not fly until sometime in the 2020s. The Canadarm was used during space shuttle missions to deploy and capture satellites, such as the Hubble Space Telescope. Astronauts also used it during spacewalks to move astronauts and equipment. After the ISS began operations in 1998, Canadarm was used regularly for space station construction activities. The arm was also repurposed after the Columbia space shuttle disaster of 2003, which killed seven astronauts during the shuttle's re-entry. Because the cause came in part due to missing protective tiles on the shuttle's belly, Canadarm (including a long extender) was used to scan the bottom of each shuttle with a camera, shortly after arriving in orbit. Meanwhile, the Canadarm's success prompted the CSA to fund two new projects built by Macdonald, Dettwiler and Associates, which by then had bought out SPAR. Canadarm2 was first installed on the space station in 2001, during Hadfield's mission. It had a better ability to move around the station, and a greater length than its predecessor. The robotic arm was originally designed for spacewalks and moving equipment around. Another use was added starting with the SpaceX Dragon spacecraft in 2012 — helping to berth certain spacecraft to the space station. The cargo ship approaches the ISS and just before arriving, astronauts on board use the Canadarm2 to guide the ship to a berthing. MDA also constructed Dextre, a robotic hand that has been used for satellite refueling tests since it arrived on station in 2008. [Photos: Next-Generation Canadarm] Dextre passed 10 years of service in 2018 and the CSA plans to equip it with a new camera in the near future. Canadian Astronaut Chris Hadfield looks on at a demonstration of the Next-Generation Canadarm Small Canadarm prototype during a visit to the NGC prime contractor, MDA of Brampton, Ontario, in September 2012. Robotics and astronauts take the lion's share of CSA attention, but the agency also has hands in other types of space work. The David Florida Laboratory in Ottawa, Canada, is a test bed for satellites before they reach space. Satellites there are shaken, baked and put through electronic interference tests to make sure they are ready for launch. The agency also funded a suite of Earth observation satellites that monitor the surface for natural disasters, changes in agriculture and even ship activities. The latest generation of its famed Radarsat series, called Radarsat Constellation, initially had a delay that prompted military concerns out of worries it wouldn't launch before Radarsat-2 failed. The satellite series is now scheduled to launch in 2018. Payloads from CSA-funded projects have also travelled into other locations. The Mars Curiosity Alpha Particle X-ray Spectrometer (funded by CSA) has been analyzing the composition of rocks on the Red Planet. A Canadian laser is on its way to asteroid Bennu aboard NASA's OSIRIS-REx mission. Several Canadian experiments are on the International Space Station, including several examining the relationship between aging on Earth and the effects of weightlessness. More Canadian experiments will be taking place in connection with Saint-Jacques' flight in 2018. Closer to Earth, the AuroraMAX camera provides live views of auroras taking place in Yellowknife, Canada. In Earth orbit, the SCISAT satellite examines the ozone layer and its depletion, particularly over Canada's north. Aboard NASA's Terra satellite, the MOPITT (Measurements of Pollution in the Troposphere) atmosphere examines atmospheric pollutants in Earth's atmosphere. In 2018, the CSA was also running a competition for students to design their own CubeSat experiments for launch from the International Space Station. The CSA also had a laser measurement system on board ASTRO-H/Hitomi, a Japanese space observatory that launched in February 2016. Controllers lost contact with the satellite in late March, and the Japanese Aerospace Exploration Agency (JAXA) ceased efforts to retrieve Hitomi in April. NASA's James Webb Space Telescope, which is expected to launch in 2020, includes participation from the CSA. Canada provided the fine guidance sensor for the telescope to point in space, as well as a near-infrared imager and spectrograph.